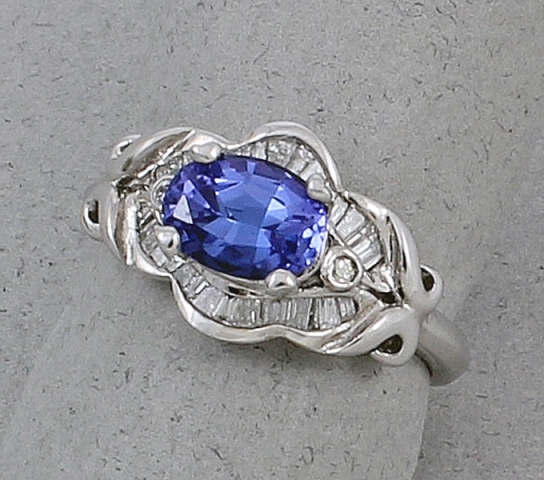 A gorgeous Tanzanite and Diamond ring by Michael Chang. 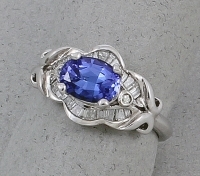 The center stone is a rich blue 1.45 ct Tanzanite, adorned with 21 near colorless tapered baguette Diamonds 0.34 tw and 2 brilliant Diamonds 0.02tw SI(g-h). It is custom made and a real eye-catcher. This amazing ring is in stock and can easily be sized to fit. Please specify your ring size, available in half sizes from 5 - 8. All rings are custom made to size and cannot be returned. If you are unsure of your size, please call for assistance. If sizing is necessary allow 2 to 3 weeks for delivery. Michael Chang has achieved a worldwide reputation for creating jewelry of unsurpassed quality and design. Each piece is meticulously crafted from solid 18k gold and only gemstones of prime quality are sought out and used. Unique and timeless in classic design, each piece is an example of craftsmanship taken to the highest degree.